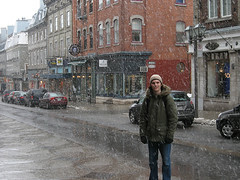 After all these sunny days you can imagine our suprise when we awoke to snow on our third day in Quebec. I was actually pleased as it gave me a good excuse to rest my weary legs! Our only sightseeing stop was the Notre-Dame de Quebec, yes our third Notre-Dame church of the trip. Not as grand as the one in Montreal but I prefered it, less imposing. From there we headed back down to Petite Champlain for a coffee in one of the little cafes and some last minute photo taking. I enjoyed our time in Quebec, it was a charming city and because it is smaller we were able to enjoy the atmosphere at a more relaxing pace.